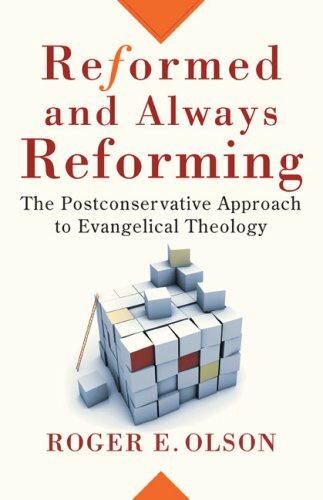 A while back, while outlining my “Reading List,” I promised I would write more about a very important book to me, namely Roger Olson’s 2007 book, Reformed and Always Reforming: The Postconservative Approach to Theology. I am now making good on that promise; however, rather than writing a short summary praising the book’s merits & interacting with any of its perceived shortcomings, I have decided (to follow Jesus!) to summarize THE ENTIRE BOOK for your consideration, which will require me to divide the posts into a number of parts. Olson’s central thesis in the book is that “it is possible to be more evangelical by being less conservative”—speaking specifically in this book about theology, which he defines as “reflection on divine revelation in order to believe rightly and understand what is rightly believed.” He distinguishes between theology and doctrine: “theology is process; doctrine is raw material and product. Theology examines doctrines (beliefs about God) and produces doctrines, often by reaffirming, restating, or revising older ones.” The last action of “revising” is central to the postconservative approach (or “mood” as he calls it) Olson will commend. In the book, Olson sets up what kind of conservative he is “post” by describing his understanding of “conservative evangelical theology.” The idea of being conservative is clearly connected to “adherence to tradition”—Olson posits that conservative evangelical’s (CE’s) have, perhaps unconsciously, established a “magisterium” that “exercises prior restraint over the critical and constructive tasks of theology” and while he acknowledges that many CE’s would deny this, “their conservatism shows in their tendency to slam down any and every new proposal for revisioning Christian doctrine” by an appeal to received traditional (or evangelical) beliefs. Paleo-orthodox traditionalists: those who explicitly identify an “ancient, ecumenical doctrinal consensus” (sometimes including Reformational teachings, but usually based on the early church fathers) as a “governing authority for evangelical theology.” These thinkers include Thomas Oden, D.H. Williams, and Robert Webber. A tendency to treat correct doctrine—orthodoxy—as the essence of authentic Christian faith and of evangelical faith, and a response to theological innovations as leading to apostasy. A tendency to treat revelation as primarily propositional, glossing over the personal and eventful nature of revelations as well as the revelational power of stories, images, and speech acts. A tendency to elevate some tradition to the status of a magisterium for evangelical theological identity (closing off fresh theological reflection & revisioning of doctrines). A suspicion of the constructive task of theology, rejecting or neglecting attempts to construct new doctrinal formulations or reconstruct old ones & a tendency to be defensive of their understanding of orthodoxy, patrolling evangelical boundaries. A view of evangelicalism as a bounded set category—within which it should be easy to tell who is in or out & a sense that they should have the authority to strip others of the evangelical label. A tendency to regard the “evangelical tent” as relatively smaller than the number of those who call themselves evangelicals. A high degree of suspicion towards both modernity (even though they may be influenced by it!) and postmodernity, which they see as relativistic and destructive of authentic Christian faith, which consists of absolutes known with a high degree of certainty. A tendency to think that it is possible to do theology relatively uninfluenced by history and culture (antihistoricist), and a recoiling from the idea that every doctrinal and theological formulation or method is culturally embedded, as they believe in and look for a transcultural expression of the gospel. A tendency to remain tied to fundamentalist roots (even though they would prefer not to use that term) in use of tactics such as harsh, polemical rhetoric and angry denunciations or ad hominum arguments when writing about fellow evangelicals with whom they disagree. A tendency to do theology in the grip of fear of liberal theology and insistence on placing every theologian or theological proposal on the spectrum of left to right as defined by attitudes towards modernity, with liberal theology representing maximal accommodation to modernity. Alister McGrath, who is also defensive of traditional orthodoxy and reluctant to express support for theological innovation, but critical of the influence of modern rationalism on theology which craves certainty through empirical-historical evidences or logical deduction from a priori truths (rational presuppositions). Olson ends his introduction by pointing out two groups which are vying for the attention of a new generation of evangelicals: a fairly aggressive form of Reformed theology with a strongly Puritan flavor, influenced by Packer, R.C. Sproul, John Piper & Carson; and the emerging church network, led by Brian McLaren. Sounds like I have a new book to put on my reading list. It seems like Olson’s book will give structure to a lot of feelings and thoughts that are floating around in the void of my mind. I feel like the C.E.E., to borrow your term, exemplifies the epitome of Western boredom channeled into intellectual projects. The highest good is the maintenance of personal piety, which ultimately serves to perpetuate the authority and control of the evangelical institution. Rather than following the call to make disciples (a highly intuitive and sacrificial process), we are instead taught to place top priority on daily personal Bible study, regular church attendance, “worshipping” (which today means consumming Christian music), and, often in dead last, sharing your particular brand of faith with a stranger in the grocery store. But if they don’t listen, that is OK because the “way is narrow,” “we will face persecution,” and we are to “shake the dust off our feet” if people don’t accept us. Christ’s message of love and sacrifice is replaced with a system that allows for our particular feel-goodery lifestyle. Well, there is an explosion of words for you. Let me know if any of this corresponds to what you have found in the book. 7. A high degree of suspicion towards both modernity (even though they may be influenced by it!) and postmodernity, which they see as relativistic and destructive of authentic Christian faith, which consists of absolutes known with a high degree of certainty. I 100% think that conservative evangelicalism is influenced by modernity, seen clearly with the appeal to a priori reasoning and the assumption that “we have no assumptions.” The basic post-modern project seems to be trying to acknowledge assumptions rather than pretend they aren’t there, and I don’t see conservative evangelicals taking any part in this tradition. I see them as akin to Descartes, who reasoned by himself in his armchair, appealing to God in order to reinforce his ideas. “Given that I am thinking clearly and distinctly, and given that God exists so he can back me up, my ideas are true.” Not only us this arrogant, but it is using a philosophical idea of God to reinforce yourself, not approaching the throne in humility. I see this Cartesian style in Evangelical Apologetics, the idea that salvation= personal-conscious-decision-to-mentally-agree-with-this-list-of-beliefs, emphasis on personal Bible study and prayer as our means to the Divine, and the assumptions of evangelical missionary work (i.e. it is America’s duty, as a materially endowed nation, to be the light to the world). 8. A tendency to think that it is possible to do theology relatively uninfluenced by history and culture (antihistoricist), and a recoiling from the idea that every doctrinal and theological formulation or method is culturally embedded, as they believe in and look for a transcultural expression of the gospel. 9. A tendency to remain tied to fundamentalist roots (even though they would prefer not to use that term) in use of tactics such as harsh, polemical rhetoric and angry denunciations or ad hominum arguments when writing about fellow evangelicals with whom they disagree. Both of these aspects of evangelicalism refuse to acknowledge that, in the grand scope of things, Conservative evangelicalism is NEW. Christianity hasn’t always held intellectual reasoning about the Bible as our means to truth. It hasn’t always been so obsessed with premillenialism and “the end times” that a kitsch book series is written on it, even a version for our children to read. It hasn’t always defined hope as “heaven-when-you-die;” Conservative Evangelicalism itself has a distinct historical and cultural context that is completely ignored as its inhabitants thank God that they have been blessed with enlightened knowledge that is better than that of other religions, and even better than that of their Christian peers (i.e. Catholicism). Great thoughts & hilarious to boot. Can you share some of your book recommendations on here as well? The one by Phyllis (?) Tickle and the response to atheism book as well? I suppose, as pretty much an entrenched C.E.E. myself, that I would respond to you by claiming that you’ve pretty seriously overstated your case. For example: “The highest good is the maintenance of personal piety, which ultimately serves to perpetuate the authority and control of the evangelical institution.” Well, yes and no. Some churches overemphasize this, yes, but I’m also not convinced that the main problem that we have today is so many evangelicals running around who are just too holy for their own good. For that matter, I think many get that emphasis on piety from, well, the Bible (by the way, here is a prediction: Olson’s book, which I’ve not read, and this whole discussion will end up hinging primarily on our views of the nature and authority of Scripture). Or again, you say: “I 100% think that conservative evangelicalism is influenced by modernity, seen clearly with the appeal to a priori reasoning and the assumption that ‘we have no assumptions. '” Mind pointing me to one serious C.E.E. theologian who exhibits or says anything like this? I suspect you’re more likely to come across it in the watered-down versions of evangelical theology. Which is sort of fair, of course, because that is also almost surely the most common version of it. But here’s where you won’t find it: in the works of Packer, Grudem, Erickson, Carson, Wells, Piper, or Sproul. They’ll certainly have assumptions, but they’ll generally be careful to try to find them and name them. And if you could point one out that they didn’t recognize, I suspect they’d gladly acknowledge that as well. One more, in a few chunks: “Both of these aspects of evangelicalism refuse to acknowledge that, in the grand scope of things, Conservative evangelicalism is NEW. Christianity hasn’t always held intellectual reasoning about the Bible as our means to truth.” I’m no expert on the Fathers, but I think you’ll find them glad to acknowledge (a) the total authority of Scripture, and (b) the need to think through what Scripture says as central to our means of truth. This in fact seems to be exactly what the New Testament quite often does with the Old Testament (Hebrews is a good example). Might I ask you what the problem with reasoning through Scripture is, and what you propose the solution to be? “It hasn’t always been so obsessed with premillenialism and ‘the end times’ that a kitsch book series is written on it, even a version for our children to read. It hasn’t always defined hope as ‘heaven-when-you-die;'” No question that heaven is overemphasized instead of the new creation as far as hope goes. But again, I’d say that heaven as we understand is in the Bible. Also, your end times example is massively frustrating to those of us evangelicals who think most of that is a load of b.s. But again, you’ll not find almost anything like that in the serious theologians (cf. the above lists). Left Behind blows. Most of us know that. Sadly, many still don’t. I guess I’d ask this though: are you spending a lot of time with evangelicals for whom Left Behind is really so influential? I don’t mean to pick on you, but I guess this illustrates a point that I think is important in all of this: popular “postconservatism” strikes me as often reactionary and overstated. I get that evangelicalism has really big, serious problems. I really do. But I get so frustrated when the response strikes me as not being careful. By the way, you are quite right that we have badly misconstrued the nature of worship (that’s a hobby horse I’m always glad to ride) and evangelism/mission. The three of us have obviously spent time together talking at some length about that. And also, I should say that Greg is right: your comment is really funny. You’re a great writer. You should blog. As always, I mean no disrespect or personal harshness by my comments. Not to say that the case has NOT been overstated, but I imagine that it is somewhat difficult for someone to oppose the C.E.E. when they are nursing at the bosom of Mother Kirk (i.e. getting a paycheck for full-time ministry in a C.E. church). Do you ever feel like you’re putting your neck or job on the line by breaking from the party line? I only ask cause I do feel that way. Not only is there an economic incentive to suppress non-C.E. impulses, but there is also an enormous social pressure, loss of professional status, etc. at work when you challenge the big guns of the C.E.E. To some extent you’re right of course. I’d probably frame the issue as one of the larger issue of revelation, but there is also the sense of what defines a Christian (could you be a Christian having never seen the Bible, or perhaps only a children’s version of the Bible, but which had no actual words of scripture, only the gist?). I would agree as to the AUTHORITY, but didn’t it seem like they had much more of a “spiritual” hermeneutic than the contemporary rationalistic one? Sensus plenior and all that? Augustine’s allegorizing certainly seems different that Ben Shin’s class…Maybe Rob’s point had to do with Carl Henry’s (and followers) propositional view? Perhaps listening to the Spirit (which could be more intuitive than intellectual), or seeing God’s words not so much as means to discover a proposition, but performative speech acts to be rehearsed? Not to dog reason, cause it’s good and all–but it ain’t everything kid. P.C.E. can be reactionary & overstated–it’s true. C.E. can be stubbornly entrenched in its ways and methods, unwilling to listen or be humbled, and turning people away from the gospel by their petty power plays and fear-based control mechanisms. AND they have some things which are good & should not be abandoned by any means (biblicism, conversionism, cross-centered piety, activism in evangelism and social transformation, value in the Great Tradition–Olson’s words). There are only SOME things that need to change…not everything. In other words, “come to the dark side,” Andrew. Just a quick note to say I will be checking back in, but my thoughts are consumed with the poison oak on my face at the moment… Andrew, I want to chew over your responses for a few more days and come back with clarity and specifics :). To Andrew, I will say quickly that I am conscious of my tendency to overstate and to create abstract generalizations, especially in this last post. I often find that a gut-response like this is how I have to begin conversations–just get my feelings out there. I really appreciate your response and recognition of this. However, I do think that many Christian institutions, past and present, try to be immune from criticism (there’s another generalization for you). I think there need to be reactionary, satirical voices regarding the church and that Christians should take these seriously rather than immediately calling foul. Accordingly, there need to be voices (like yours, Andrew) that critique the critics and seek to be constructive. I think that it is good to call people out as reactionary and overstated, but I also think that we should not fail to acknowledge that they are reacting to something. So that is my general response… I hope to come back with specifics when I’ve had a little more time. Like you said, I think a lot of this does hinge on how we read the Bible (if you guys have time, an old teacher of mine has just started blogging on this subject over at his blog draw-nigh.blogspot.com. His last 5ish blogs have engaged this topic). I also think that a lot of what I have problems with is not the letter of what CCE’s say, but the attitude with which they approach their theological projects, as well as what the methods and processes they use communicates to the CCE “lay-people” and to the world. (Resonating with Greg’s sentiments, for instance, I interact with a number of Biola folk who take Left-Behind-esque rapture/end time thinking seriously; although, it seems these ideas of more recently been used as jokes than anything else: a guy finds his roommate’s clothes in a bundle on the floor, as if he had disappeared through them, cries, “It’s the rapture!” The audience laughs, the boy smirks at his pseudo-mocking Christian wit). 1. I have to wonder a little about Olson’s categorizations of the various groups he’s disagreeing with and whether they would recognize themselves in his descriptions. They might, but I also know that it’s far easier to argue with a reduced and neatly packaged “other,” focusing on their most polemical aspects, than it is to argue with a complex and nuanced one. I guess that’s the nature of argument in any context. 2. He seems to be objecting to their “absoluteness” and their assertion of the doctrine they subscribe to as directly stating Biblical truth, and I understand the concerns this might raise (how can any man or group of men claim an ultimate or superior reading of the Bible? How can we positively rule out new understandings or interpretations? etc.). However, doesn’t anyone claiming something to be true and right have to be claiming that something else is not true and not right? Asserting that there are no absolutes and that there is no way to be certain is…an absolute. I would have to question the integrity of an assertion or argument that says, “I think this is true. Maybe. But I could be wrong. And you should be aware that I’m influenced by my [fill in the blank] outlook and cultural upbringing.” I have seen (as have we all) so many vapid, self-interested, and flat out wacky theological practices and outworkings in modern Christianity as a whole that I feel that there is a place for striving to know and assert certain core and absolute Biblical truths and defending them. 3. This is not to say that there hasn’t been an unhealthy over-emphasis on intellectual understanding and “correctness” in the Evangelical tradition, or that this type of theology hasn’t produced more than its share of Arrogant Evangelical Pricks (A.E.P.’s). But, as the saying goes, don’t throw the baby out with the A.E.P.’s. On a personal note, while I haven’t read a ton of him, I have to say that I dig Packer and have felt richly blessed and enlivened by his work. Or at least the first four chapters of some of it. 4. Finally, call me Pollyanna, but rather than being distressed by the polemics and the friction in the body of Christ, I think it’s kind of awesome. I like those staunch Calvinists and Puritans drawing their lines in the sand and setting a clear boundary, and I like that there are others saying, “wait a second!” and getting pissed off. Given humanity’s gift for taking good and true things and distorting them, I think the truest glimpses of God come through ongoing and dynamic tension. Love each other, yes (although we fail miserably most of the time). Agree with each other, not a chance until we are in the New Creation hugging it out in our perfected bodies and souls. Going back to the kid table now and taking a Tylenol. Thanks for your thoughts Katherine! This is exactly the kind of perspective that is helpful for me to consider as I am on this theological journey. I want to offer some thoughts to your points 1-4, but overall, I just want to take in your thoughts and allow them to be counterpoints/balance to the approach I’m considering. 1. There’s definitely a point to be made about whether the C.E. characterization is a straw man or easily dismissed version of the other. Olson includes a ton of caveats about how his 10 features do not fit everyone & he even praises C.E. thinkers in other places in the book. While much of what he says may sound negative in the way it’s presented, I think many of these thinkers would use different words to express the same thing—with pride! However, I’m sure they would not like to think of themselves as evangelically exclusivistic or even fundamentalist…yet that is how, I would agree, many of them are perceived by those outside of their own camp. Many C.E. thinkers have called Olson part of the “evangelical left” in books, or “drifting towards liberalism” which are supposed to create fear in the minds of the average C.E., but are descriptors which with Olson himself does not agree, so I hope he’s not just returning the favor here (I feel like he is generally considered irenic and balanced in his presentation). My experience reading the way many C.E. theologians write about those with whom they disagree, who is in/out, etc. as well as experiencing this sort of person in my own life, confirm that, while the portrait may sting (as Jesus’ descriptions of the Pharisees certainly did), there is a great deal of “hard truth” to it. 2. I totally understand the uneasiness one might feel with someone who is criticizing “absolutes known with a high degree of certainty”—I myself hated what I saw as the relativistic attack on absolute truth for many years & I still would oppose anyone who claimed that absolute truth did not exist. Olson does believe in absolutes, there is just more humility in how many absolutes he believes he has ABSOLUTELY the perfect understanding of. However, the postconserative approach does move away from the search for “certainty” in rational propositions and objectivity to “coherence” and relational trust (further posts will outline this). You wrote, “I would have to question the integrity of an assertion or argument that says, ‘I think this is true. Maybe. But I could be wrong. And you should be aware that I’m influenced by my [fill in the blank] outlook and cultural upbringing.’” I’m not completely sure of what you mean by “integrity” there. In one sense, a person saying this is putting all the cards on the table (which I think has virtuous components, while not really necessary to say all the time since I assume it), whereas many others would say that what they believe is true with complete confidence and as if it were simply objective reality, when in truth, none of us can KNOW 100% for certain that what we believe is true—which is why we have “faith” (maybe you wouldn’t agree—I have some thoughts on why God did not reveal himself in factually indisputable ways, but that’s a long conversation). Maybe you meant integrity in a different way than I am understanding it. However, I completely agree about anyone who says there is NO absolute truth—it’s just the AMOUNT that WE have might be where the C.E. and postconservative would disagree. 3. I agree (as would Olson) with your thoughts on Packer and other C.E. thinkers. It does not poison all of their contributions to call them out on certain tendencies. Olson and Packer both contributed to a volume on new approaches to theology where Packer was surprisingly supportive of the postconservative approach of Kevin Vanhoozer (Evangelical Futures, ed. John Stackhouse). I also remember reading a very thoughtful and relationally-sensitive response that Packer wrote about John Stott’s position on annihilationism. I definitely don’t want to throw out all the ideas or positions of C.E. thinkers. But there are some areas where it seems change needs to occur. 4. It’s probably this point I would disagree with the most. I am a moderate/centrist type person, so maybe it’s just me, but I find that Glenn Beck/Al Franken polemical polarization is completely unhelpful (in a general sense) and is even anti-Christian in our own ranks. That’s not to say we can’t have disagreements between Christians, which, of course you are right, are unavoidable in this present age. I would say that a gentle and peace-seeking approach is most befitting to Christian thinkers and is quite possible if we center on the gospel as uniting us in the love of Jesus for one another. And we should seek to exemplify the kingdom “to come” in the here and now—to bring heaven down to earth in our way of relating with each other! I myself kind of EXPLODED a few weeks back with a post on the C.E.E. and have felt regret for my own condescension to other Christians—however, my feelings were arising from encounters with those who think, quite confidently, that they are totally right about the way they are representing evangelicals (and Christians by extension) with their judgmentalism, moralism, nationalism, etc. If I encountered people who were like, “I do believe America is God’s special, chosen nation and here are some thoughts why; however, I may be wrong and may be influenced by my own upbringing and I’d love to talk this through and hear your opinion” I think I would wrap my arms around them and kiss them!!! However, I need to be that kind of person too. I don’t want to end up getting enraged by other Christians’ perspectives, but to try to engage, understand, and peacefully disagree with the minor points while unifying on the majors. And you’re right about #4. I was thinking too narrowly about the academic exchange and ignoring the whole populist forum of talk radio, etc. which I agree can be terribly damaging and hateful. Plus I was throwing around the “polemics” term too flippantly. I agree with you 100% that a loving, humble, and Christ-centered way of relating to one another in this discussion is the way to go. I think what happens so often, though, is that we get stuck in either total nastiness on the one hand, or a kind of watered-down P.C. niceness on the other instead of the aforementioned way of relating. So, as badly reasoned and presented as my original assertion was, I still feel that passionate disagreement (where it’s not a purely intellectual exercise, but it goes to the core of people) is a good thing in terms of pushing people out of complacency and getting them to grapple in an honest way with what it means to be a Christian. Obviously, though, it’s hard to do that in a loving and life-giving way. Really helpful summary of Olson’s thoughts. I don’t have a ton to say yet, but I think I will the more that you write. There is probably plenty to say about the 10 C.E.E. commonalities. But I’ll watch for what you emphasize before I go there. Like I said in my response to Rob above: I suspect that so, so much of this will come down to what one thinks about the nature of Scripture. I’m glad to have you (and these others) in on the conversation. You are a careful and articulate thinker–even if you are off in your totalizing assumptions (JK kind of?). I wish we could talk on such things more often.